In the last article I explained several ways to power the Zoom F8. There's an option for everybody. My own particular priorities are reasonable cost, ease-of-use and safety, lowest possible weight, and fairly long recording time. I will consider these in slightly more detail, before turning to some real-world battery tests. This article will conclude by quantifying several different solutions, so that you can make up your own mind. The Zoom F8 is a value for money proposition, and I would like my battery solution to follow suit. It is possible to spend as much on batteries as the recorder itself, but that is definitely overkill for anything but a film set. Since I need to travel on flights in a sometimes nervous Europe, I don't want to carry anything with protruding wires or other "suspicious" characteristics. Nothing should look home-made. Regulations limit each cell to 100 Wh which, in truth, is plenty. Finally, I would like a reasonable long runtime. Sometimes I make nature recordings for hours at a time. In order to determine which batteries are best suited to this practice, I performed some battery life tests. My test regimen was as follows. I powered two AT3032 microphones with phantom at 24V. All outputs were set off; I monitored with headphones. Time-code was also off. I recorded two channels at 24 bits 96Khz, using the safety feature to record backup tracks on channels 5 and 6. Both 64GB SD cards were set to record poly ISO tracks. Hence, each resulting WAV file contained four channels. I continued recording from a full battery charge until the machine shut itself off. By the way, the F8 performs such a shutdown cleanly and with no damage to the files. The recording is split across files at the 2 GB limit. With a set of fully-charged 1900 mAh Eneloops inserted, and the battery type set to NiMH, the unit reads 10.9 V, above the nominal 9.6 V, as we'd expect. The total recording time was 1h 41min. I then tried the same test with the battery type set to Alkaline and got a tad more, 1h 54min. A run time of 2h 40min can be extrapolated for 2900 mAh NiMH. Since you can now buy these for the same price as the cells I have, there's no reason not to use them. I was curious to compare this result to the values in the manual, but none of the listed constraints matched my test parameters. When recording on 8 channels using phantom power, using 2450mAh NiMH batteries, Zoom estimates "2 hours or more" of recording time. That seems a tad optimistic. Nonetheless, these are still very good results for a multichannel recorder. People report much lower times when using other brands. In those situations, AA batteries are often only used as a temporary means of maintaining power while switching the main power source. 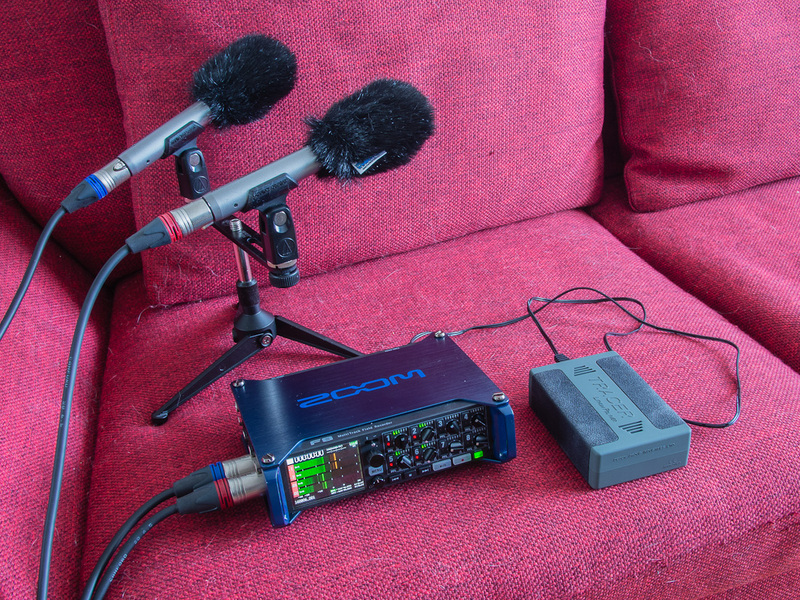 But with the Zoom F8, one can reasonably use AAs as the primary power source, so long as your recording time requirements are not too demanding. Keep a second set on hand and you are fine! Two 2900 mAh battery sets, plus the sled and charger take up only 406 cubic cm (because one is inside the recorder) and weigh 600g. The price is about €50, the cheapest option by far among those I will consider. This format also has the distinct advantage of being available anywhere in the world, at a market or corner store. I can see why Zoom opted to provide a consumer battery format with this recorder. Good decision! I ran the same performance test with the Tracer LiPo 48Wh battery, powering the F8 through the DC input. At the end of a long day, 54 GB out of each 64GB card was filled. The recording lasted 13 hours 57 min. Fourteen hours out of one battery... and this is the smallest capacity in the Tracer range. Wow! Two batteries plus a charger total 750 cubic cm and 925g. Purchased direct, the price including a DC connector is €220. I you need even more power, the 96Wh version totals 1114 cubic cm and 1405g, costing €305. This is cost effective, since for only 50% more investment you get twice the battery life. However, the size factor ruled these out for me. It should be noted that these LiPo batteries are only rated for 300 charge cycles. Since I don't record every day, this is more than enough, but this limitation might be a concern to you. In that case, consider the Tracer LiFePO4 formulation. These are rated to 1400 charge cycles and are waterproof to boot. They cost fractionally more, but are almost twice as heavy. Again, this was the deciding factor. But hey, we have options! I didn't acquire these formulations after testing the Tracer. A pair of 73 Wh NP-1 batteries, cup, and charger, as specified in the previous article, have a volume of 2500 cubic cm and mass of 2305g. The best price I found was €535. While these batteries are popular, I'd have to say it's only through familiarity. Recordists have them on hand from previous gear, and don't much care about the size. For me this older technology is both too expensive and too bulky. The Sony BP kit can be assembled from eBay parts for €200, but I would hate to explain it to security personnel. I prefer the safety and ease of handling that comes with a self-contained regulated unit. Since I didn't obtain the parts I can't provide size measurements or battery life. I can be quite sure these won't be as efficient as the LiPo batteries. And given how good the AA batteries are, I'd rather stick with them and save money. I've put the results into a handy comparison table. Every kit contains two batteries and a charger, as already mentioned, but the capacity and duration are for a single battery set. Extrapolated times are shown with an asterisk, but I have no way to guess the missing value. Swit NP-1 Li-ion 2305 2500 73 ? It is obvious from this table that one cannot compare power capacity across battery formulations. The LiPo chemistry is simply much more efficient. What I learned from this exercise is that the Tracer 4Ah LiPo is my perfect solution! Your requirements and results might differ. I present this here as another data point, one experience among many, that I trust will be useful. If any of you wish to run the same test with your own battery setups, I'll credit you and add the results to the table. Hi! Thanks for the detailed comparison. I have also contemplated about upgrading powering my F8 (and mixpre d) for field trips (and sometimes flying is inevitable). I just purchased SWIT NP1 battery system when I found your post here. So I was a bit frustrated that I probably made a bad decision. Then I started to calm myself down - for the fieldtrip I will most likely carry just charged NP1 batteries, not the charger. One Swit NP1 weighs only 690 grams (two - 1380 g) and volume is 324 cm3 (two - 648 cm3). Battery cup will add up of course. For the 530 euros you got two batteries (2x73 Wh). When I receive the batteries I will test how long they will last when recording in field. I should update this with the comment that I have NEVER needed two Tracer batteries. When am I going to need to record for more than a day running? So really the cost should be half of what's shown. Just got an f8 and your blog has been invaluable, thanks! Regarding the LiPo batteries and the connection, do you think the dc input is sturdy enough for the field? The hirose looks a tad sturdier but i never had any experience with this. Yes, that looks like the one. There is some debate on which power input to use. The Hirose input is no doubt safer, since it can take a wider voltage range. The locking connector is also handy, as is its position on the side of the unit. With the recorder in a bag, it's a pain having to access the rear surface. However, you will need to wire up a custom cable. You can buy a cable with a raw end from Tracer and then connect the appropriate Hirose yourself, but my soldering tasks are not up to the task. It's rather fiddly! Sine the Tracer is 12V, it is within spec for the DC input. Some people worry about the battery being overcharged and hence providing too big a potential for the device. I think that with custom battery packs and less sophisticated technology that might be a real concern, but the Tracer is obviously over-engineered with the latest regulatory circuits built in. I have been using it with the DC input with no worries. Hey, first of all great article, very informative, I've recently bought a tracer lifepo but I'm considering making an hirose connection on my own since as soon as I tried connecting it to the rear dc input the zoom measured 13.6V on the display; isn't that going to fry the unit? Hasn't this happened to you as well? Sorry for the delay in posting some comments. They were stuck in Blogger limbo. Zenn, that voltage seems way too high. Not set up to check at the moment. Thanks for all the hard work! Putting in an order with Tracer now, and it looks like they've started offering a bullet -> hirose plug in the store. It's a little pricier, but definitely cleaner. I would also imagine it to be safer, because of the voltage allowances on hirose, no? Yes! Well worth getting that adapter. I'll say these are all great and interesting options. I guess the main reason I use NP-1s and pay the premium is because I can also use the power distro for multiple Lectrosonics receivers. I don't think and other solution allows for this flexibility. FYI the NP-1s I have are LiPo from IDX. I usually can get a solid 12 hr day with one additonal SRc going. I usually switch them out at a reasonable voltage and don't push it to the red.